Let’s face it, we wouldn’t have streetwear and hip hop fashion without hip hop icons starting it all. Without hip hop becoming what it was in the late 70’s and hitting the mainstream in the early 80’s, artists wouldn’t have started a revolution with their styles and trends, and who knows if we’d have streetwear today if it weren’t for them. And with hip hop turning 40 this year, we thought we’d take a look back at all those styles. So let’s take some time to appreciate our roots of hip hop fashion, as we touch on the early stages during the late 70’s and early 80’s. Hip hop was but a burgeoning movement in the early to mid 70’s, with DJ’s mixing and looping funk breaks, while rhyming simple verses over tracks to get the crowd hyped, thus creating rap. Pioneers such as DJ Kool Herc, Afrika Bambaataa & the Zulu Nation, Grandmaster Flash & The Furious 5, and Fab Five Freddy developed the very roots of hip hop and pushed the culture into the mainstream audience. Their popularity helped showcase new and unique looks in fashion, with styles ranging from fresh and innovative, to the very least, interesting. Think American Apparel meets the Village People meets disco meets a lot of pleather. These fellas definitely didn’t have many body image issues, clad in tight leather and showing skin whenever they pleased on their not so tight and not so pleasing physiques. Nevertheless, it was about the music; their careers were growing, with nothing in their lives plunging except for their necklines. Then, in 1976, there was The Force, with a member we may have heard of named Russell “Rush” Simmons. After he met a young Kool DJ Kurt, Rush changes Kurt’s name to Kurtis Blow, convinces him to rap, and gets his little brother Joey, “DJ Run,” to DJ for Kurt. Soon after his gig with Kurtis Blow, DJ Run, along with friends Darryl “D.M.C.” McDaniels and Jason “Jam Master Jay” Mizell, formed Run-DMC. They released their first track in the early 80’s and created a new buzz in hip hop with their fashion. 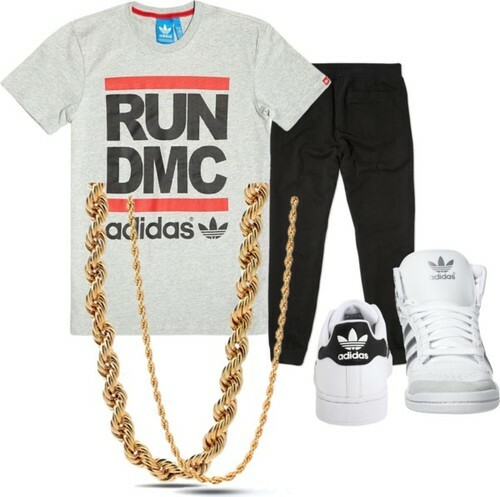 It was basically the first real trend that was new and flossy to the time; you could actually buy pieces of clothing that resembled their look, rather than just dressing “funky.” They wore clothing that the community was wearing, boosting the image of Adidas and other sports brands. Oh we believe you, Trinidad. And we can all believe that some trends from the 70’s and early 80’s have stayed, while some are coming back this season. I mean honestly, who ever thought that they would make bucket hats stylish again?